Innovative and sustainably produced wood products, when coupled with sustainable forest management, can ‘build the future’ and contribute to the achievement of the Sustainable Development Goals (SDGs). In a sector like construction, which globally accounts for 6% of total energy consumption and 11% of global energy-related CO2 emissions, alternative materials like wood can contribute substantially to moving towards sustainability. Wood products such as innovative cellulose fibres can also provide alternative materials for other sectors such as textiles, which relies on water-intensive crops like cotton, and carbon-intensive materials like polyester. This is the key message of the Vancouver Invitation on Forest Products for a Better Future, a bold and forward-looking statement of intent to harness the environmental, economic and social benefits of sustainable forest management. The Invitation was developed with Canada and with the support and input from UNECE countries. 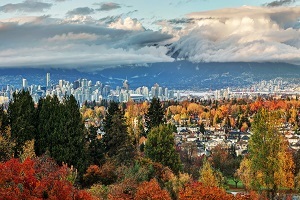 It garnered support by more than 200 government officials, representatives from the wood products and construction sectors and civil society actors from around 50 countries, who gathered in Vancouver, Canada, for the 76th Session of the UNECE Committee on Forests and the Forest Industry (COFFI). Under the title ‘Building the Future with Forests’, the conference provided an opportunity to explore key developments and sustainable solutions for the wood products sector, specifically the possibilities of using wood in construction and the opportunities for creating a circular economy. The environmental benefits provided by forests, such as water and air purification, soil formation, carbon storage and biodiversity conservation are hard to ignore. It is, however, less known that forest products also play an important role within the broader context of achieving sustainable development. The Vancouver Invitation on Forest Products for a Better Future thus aligns with the spirit of the Rovaniemi Action Plan, a blueprint to guide the transition to a green economy in the forest sector in the UNECE region. The Vancouver Invitation aims to not only strengthen support but also build trust in forest products, which creates additional demand and ultimately increases the value of forests. Creating additional value is one of the best ways to keep forests standing, as it prevents them from being cleared for alternative, unsustainable land uses. Maintaining forests and creating sustainable forest value chains is critical for achieving the SDGs.